UNI-Mono is a translucent monofilament thread ideal for salt water flies. 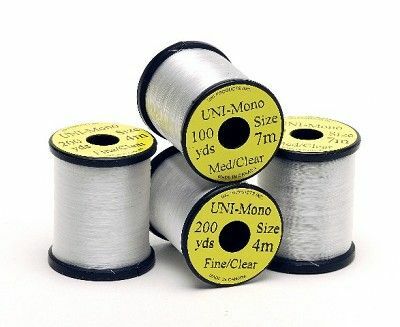 It is a fine, supple, monofilament with 200 yards on a spool, fine and clear, .004" (.10 mm.). It is also available in a medium clear, .007" (.18 mm.) size on spool of 100 yds. UNI Mono thread is ideal for saltwater patterns, being a clear thread it disappears when touched with head cement or superglue. The most popular fluorescent floss available. In 16 brilliant fluorescent colours. Sheer Ultrafine is 14/0. The finest of threads. A super quality single strand floss. A blend of nylon and rayon it is strong and shiny. 15yd spools.